I'm in love with bubblesuits. Perfect summer baby wear, as far as I'm concerned. 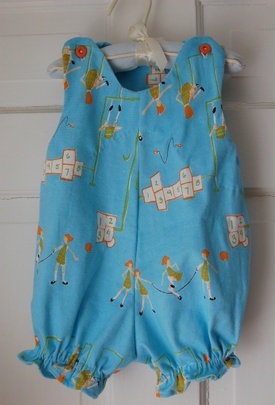 I used a vintage pattern for this, and some Munki Munki jersey playground fabric I've been hoarding for far too long now. I'm so glad it all worked out in the end-- it got a bit hairy for a moment when I realized that two of the pattern pieces were missing (not good when there are only four pieces to begin with), but I wung it and I think it's all good.